A platoon of camouflaged soldiers steps from a Blackhawk helicopter and eases quietly through the yellow-green night-vision glow toward its target. Once the troops assemble against an exterior wall, an explosion blasts through an adjacent door. The midnight raid is on. It’s not real for visitors to the First Division Museum at Cantigny Park in Wheaton, IL, but a new virtual reality (VR) exhibit with vivid audiovisual elements gets them as close to the action as possible. The First Division Museum tells the history of the first permanent division of the regular U.S. Army, formed in 1917, to serve on the Western Front of World War I, through tanks, artifacts, and more from every theater of war where the division has served. Part of a major exhibit redesign completed in August 2017, the museum’s VR experience transports 14 visitors at a time to a compound raid from the cabin of a replica Blackhawk. Video content captured from a four-camera rig, including 360-degree footage, gives visitors the soldiers’ point of view, while augmented stereo sound effects blend with human voices for a realistic immersion into a modern military campaign. “We felt that allowing people to get on board a Blackhawk helicopter, put on a VR headset and be immediately transported to the moment of being on the helicopter with a squad—and then go with those guys through the entire operation, and really see what it would be like—was something unique,” Snow said. Museums are moving outside the traditional exhibit space by exploring creative ways of getting visitors inside their stories and subjects. Audiovisual technologies are playing a lead role in these immersive and interactive spaces. At the Museum of Science and Industry in Chicago, a 400,000-square-foot facility that welcomes more than a million visitors every year, a reimagined submarine exhibit combines video, audio, and physical media and effects to put visitors in a simulated World War II battle. The U-505 Dive Simulator draws visitors deeper into the story of the collection’s 251-foot German U-505 submarine, captured off the coast of Africa in 1944, with an immersive, videogame-based sensory experience. The simulation begins with a tutorial that weaves in historical context, showing how submarine crews reacted to threats from other vessels and aircraft in a combat setting. Then, the user is propelled into the heat of battle, with a challenging dive order to avoid a torpedo that leads to one of four outcomes based on the user’s skill level. Each simulation station faces three HD LCD screens with a 5760x1080 composite resolution, arranged to give the user a wide-angle visual. Audio of the simulated mission—the sounds of the engines, a commanding officer barking orders—hits the user in 4.1 surround delivered by four loudspeakers in the headrest. Two ButtKickers, one under the seat and one on the steering column, take the place of subwoofers and give the sensation of movement and impact. Creative uses of audio are also part of the Mississippi Civil Rights Museum in Jackson, MS, which tells unvarnished stories of the civil rights movement in the state. Visitors walking through the first two of eight galleries randomly trigger flash points and hear barking dogs or harassment from disembodied voices. The effect addresses the culture of fear that African-Americans experienced in the Jim Crow era in the Southern U.S. The museum’s centerpiece is a towering, reactive light sculpture that fills the central area connecting all seven other galleries, named “This Little Light of Mine” for one of three civil rights-era rallying songs used in the exhibit. Sensors placed in four different zones in the room detect movement, so as more people gather in the gallery, more voices are heard singing. Addressable LED strips adhered within the sculpture also react with increased intensity as the crowd grows, creating a brilliant, unifying collage of light and color. “The initial story of civil rights is such a dark story, and it's such a strong story [that] evokes such strong emotions in people, that we needed a space for people to stop and take a breath before they continued their journey,” said Richard Woollcott, vice president of museum planning and exhibit design at Hilferty and Associates. “The sculpture was designed to remind everybody that it was the combined forces of everyone working together, all of those lights coming together, to create the civil rights movement,” he added. 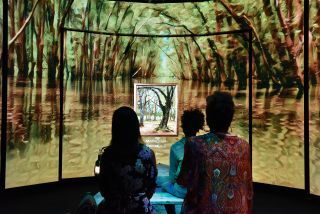 Ninety miles east in Meridian, MS., the Mississippi Arts and Entertainment Experience incorporates RFID-triggered projection and curved LED screens to educate visitors on the state’s native creative luminaries, including William Faulkner, Oprah Winfrey, and Jim Henson. Design firm Gallagher and Associates, which counts exhibits at the International Spy Museum and the National Archives in Washington, DC among its clients, drew from its team members’ experience in theatrical art and design for the museum project. The group’s extensive projection mapping experience was key to a series of overhead-projection pieces, including an exhibit on literary figures where 4K video animates a blank writing desk and typewriter with details on the writer’s life and writing style. The museum’s culinary experience takes this concept a step further. When visitors place RFID-tagged plates at specific locations on a dining room table, RFID readers trigger tailored video content from the overhead projection system. Visitors learn about regional cuisine and the favorite foods of famous Mississippians, like Elvis Presley’s peanut butter and banana sandwich. The museum also features a video experience that takes visitors on a simulated boat ride through the state’s natural history, using a series of staggered, curved LED screens that engulf viewers for a three-dimensional effect. “I think [that arrangement of screens] creates a much more immersive environment,” said Effron. “It puts visitors in a very realistic envelope.